At BIAFF 2009 Together - An African Success by Ned Cordery got a 4-star award. We are home from the great African adventure. This began when we were visiting our friends Margo & Chuck. After a good dinner and excellent wine, I said to Chuck that I would like to make one good film before I fall off my perch. Chuck knew just the subject! He is a Governor of the Iowa State University Foundation and a project near to his and Margo's heart is the ISU (Iowa State University) CSRL (Center for Sustainable Rural Livelihoods) activity in Uganda. This is a three way co-operation between CSRL, VEDCO (Volunteer Efforts for Development Concerns), a Ugandan NGO and Makere University in Kampala, pledged to helping the small farmers of the area. The ISU people liked the idea, so we all got together at Ames, Iowa on one of the snowiest days in winter and planned what we could achieve. We believed we could make three short programs, a general documentary, a short to orientate students preparing to work on the project and a short to entice donors. The project was green lighted. 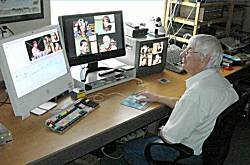 Around the world television is moving to digital high definition and all new programs are originated in an HD format with a 16:9 picture (wide screen) so my old standard definition system was no longer appropriate. A wonderful opportunity to spend money with the approval of the director of the budget. So the studio was re-equipped with, a new Intel Mac, HD software and a Sony HDV deck. 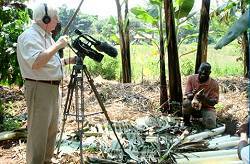 Two HDV cameras were purchased; we had to have a back-up since if a camera went down in the depths of rural Uganda the project was an instant bust. They were a Canon XH A1 and a Canon HV 20. I spent time getting used to it all, including shooting and editing a short documentary using Final Cut Pro 5.1HD as my real entry into the HD world. The XH A1 with three batteries and a charger, the HV 20, two batteries, the charger and the Raynox 0.7 x wide angle lens attached all went in. Experience had shown that modern batteries last much longer than the older models and I had got through a day shooting two hours of tape, on one battery. Three external microphones were included. A Sennheiser MKE300 usable on both cameras but never used. An Audio Technica 897 with a Rycote Softie for the XH A1, this became the workhorse of the project and performed perfectly, and a Canon DM-50 with a home-made softie specifically for the HV 20 hot shoe. Sony MDR-V150 lightweight headphones which continued working after I had sat on them and completely dislocated the right earpiece. 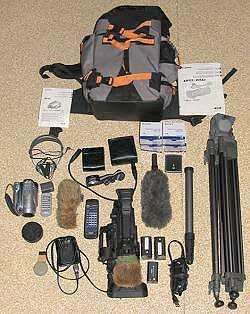 The Cinebag met the carry-on size requirements so the cameras and microphones never left my side. The Libec Model TH650 tripod was packed in the checked baggage with the head removed from the legs; this is a solid light weight tripod although the head is less then perfect for pans and tilts. A monopod was added to be used as a mic boom if necessary and for areas where the tripod couldn't be used. Forty, one hour tapes were packed, half in the carry-ons half in the checked bags. On June 21st we parked in the long term car park at Las Vegas and headed out half way across the world. Las Vegas to Minneapolis/St. Paul, on to Amsterdam and then South to Entebbe, Uganda where we arrived at 8:15 pm in a dark, African night. The drive from Entebbe to Kampala took about an hour through a dense traffic of cars, trucks, motorcycles and bicycles driven with furious abandon and a general tendency to drive on the left. The hotel was superbly comfortable and we slept off 30 hours of travel. The next morning we were greeted by Agnes of VEDCO, taken to the office for orientation and to interview, on camera, key VEDCO people. We had hit the ground running. Agnes the VEDCO Advocacy manager was our guide and mentor for the rest of the trip, a tall elegant woman, with a sense of humor and a no nonsense style. We saw the full force of her personality at the farmer's day in Kamuli, more of that later. Chuck and Margo joined us with Richard from ISU so with our driver, Immanuel, along with Agnes we boarded the "Hog Safaris" (yes, that really is their name) Toyota van for our journey into the interior. We spent a day at the experimental/development farm run by Makere University and were shown a wide range of activities, some specifically aimed at the small farmer. The faculty members presented to camera and graduate students showed us their current projects. In the afternoon we met the Dean of the school of Agriculture and then set out to Jinja, a town on the edge of Lake Victoria and the source of the Nile. The hotel provided good food and a great view of the Nile. The next morning on to Kamuli, the center for our filming over the next 5 days. The road was surfaced but the surface in need of repair in many places. We passed through bustling villages, everywhere traffic, now mainly taxis, motor bikes, bicycles and streams of people walking, often with heavy loads. There are very few overweight Ugandans, a limited diet and a lot of exercise keeps the weight down. We arrived at our "hotel" in Kamuli, the Pentagon. The room had a bed and a mosquito net, a non-functioning shower and non-flushing toilet, a rail to hang some clothes, one room had a mirror, it wasn't ours. We quickly learnt how to live, the shower comprised a bowl to stand in and a gallon of scalding water delivered to the room each morning, diluted with cold water and then poured over the head, soap and then rinse, which after all is what we do anyway. The toilet was flushed by briskly pouring a bucket of water down it. The staff was attentive and friendly and we could get beer at the bar, the power was iffy and went out several times when a very noisy generator would kick in and power the lights but not the sockets and also ensure that nobody slept. VEDCO have an office in Kamuli and ISU have rented a nearby house where students are accommodated and fed, we went there for our breakfast and dinner and collected our packed lunches. Ibrahim of VEDCO had set up our itinerary and we were off along the red dirt roads to visit VEDCO farms, meet the local officials and farmers and film what was happening in their world. Everywhere co-operation, good humor, an astounding ability to talk to camera as if they had been doing it all their lives. Moments of comedy, as when in the depths of the countryside after traversing a washed out road we reached a small farm where the farmer had developed an organic treatment for banana wilt, just as he was getting into his demonstration his cell phone rang. The cell phone has transformed communications in a country that has not been wired. During the second week of filming the highlight was the VEDCO Farmer's day where they showed their work in small booths, demonstrated new methods, checked out the quality of the produce and discussed farming. The local band played, the schools provided dancers and musicians and as with all good outdoor events it rained for about 20 minutes with no affect on the program. Politicians talked, and then there was a grand prize giving for the best farmers. The whole event MC'd by the magnificent Agnes. Ugandans are great believers in education and we filmed ISU & Makere students teaching in the local schools, where packed classrooms listened attentively and completed tests of their knowledge. In the school "gardens" the students learn good agricultural methods and grow crops for their own meals. Finally as a contrast we visited a non-VEDCO farm, a farm that had not benefited from the advice and expertise of the VEDCO staff and their farmers who act as advisors and provide basic health care in their communities. The family was starving, the farm badly run, the crops poor and they begged, not for money but for education in how to get the best from their farm. This was the most sobering moment of the whole experience; this was the reality underlying the work we had seen. What is our impression? A hard working people desperate for education and guidance, very much a case of "give us the tools and we will finish the job", everywhere music and dance, good humor, dignity and enthusiasm. The women seemed to do much of the farm work, bear in mind that a very large farm is 4 acres and the usual size is 1 acre. Bear in mind that a well run 1 acre farm can support a family. The standard tool is a hoe and the most wanted form of transport is a bicycle. Water may be as much as 2 kilometres away at a borehole and has to be transported in 5 gallon jerry cans, a job often done by the children. Cooking is on charcoal and there is no lighting. The equipment worked well with the exception of the "Petrol" LCD shade for the XH A1 which was difficult to fit accurately and quickly. Both cameras gave excellent service. The HV 20 was used as a B-Roll camera by three inexperienced users. everything was set on automatic. The results were remarkable and a couple of shots saved my life! Nothing broke; the back pack was a great solution to carrying equipment around. Filming black people is quite different to filming white people, their skin absorbs light and exposure and lighting are critical, an on camera light would have helped but generally we were able to set people in favourable natural lighting conditions. My wife, Mary, managed the continuity, kept all the notes, took 600 still photographs, managed the travel and checked sound. We shot 24 hours of material all safely brought home and duplicated so that the safety copies can be stored in another location. Now for the giant task of editing. A wonderful experience, many extraordinary people helped, took part, cared for us and introduced us to an Africa many do not get to see. To them all our thanks and gratitude, now it is up to us to serve them well with the films they made possible.